Lucky for me this year I don’t have to dodge future parents of students in Walmart while I’m reprimanding my own children or fight other teachers for the last blue notebook that will complete my set of thirty at Target. Instead, I’m here at home on my computer, and excited to post my VERY first recipe for this blog. Hooray for small steps! This is one of my favorite go-to recipes for breakfast when I’m alone or when we have company. It’s simple enough to make for one and just as easy to whip up for ten, which I’ve done before when family came to visit us in Salt Lake City during the summer to beat the Arizona heat. One of the reasons I’m posting it first is because it was one of the very first recipes I tried out on my husband. This was pre-kids, pre-house, pre-kitchen confidence (although I’m still working on that one). It had to be simple because I had no idea what I was doing. I did know that I wanted something semi-healthy. After all, in the near future (or ten years later-whatever) I was going to be a doctor’s wife. Shouldn’t I know how to make something that was healthy? LOL. Anyway, this was a big hit with Mike. Later, when my sister and her husband came to visit Lori (my sister) later told me that Nando (her hubby) was talking about the delicious “egg-bagel-thingings” Lori’s sister (that would be me) made at her house. When Lori told me that on the phone I was excited enough to be doing punches of victory in the air. So here it is. The recipe for “egg-bagel-thingings” that I’m going to call “Breakfast Bagel” despite Nando’s great name idea. It calls for adding apple-cider vinegar which seems weird, but gives the eggs a different almost sweet flavor that helps make something simple like scrambled eggs taste unique. Letting the garlic sit in the olive oil long enough to scramble the eggs also helps give this dish flavor and it softens up the bagel just right. Hmmm…it’s already five here in Michigan but it has me thinking…breakfast for dinner anyone? 1. Peel and dice garlic cloves. Put them in 1/4 cup olive oil and set aside. 2. Turn frying pan on medium and scramble two eggs. Add the two teaspoons of apple cider vinegar and turn to low. 3. Toast the bagel halves. While the bagel is toasting slice the tomato. 4. Spoon the (now garlic-flavored) olive oil over the insides of both halves of the toasted bagel and set them open faced on the plate. Be sure to miss the garlic pieces, you don’t want those, just the oil. 5. Top the bagel halves with fresh spinach and sliced tomato. (Two slices of tomato per bagel half. Not that I don’t trust you to do the math, but I’m used to explaining directions to third graders!) 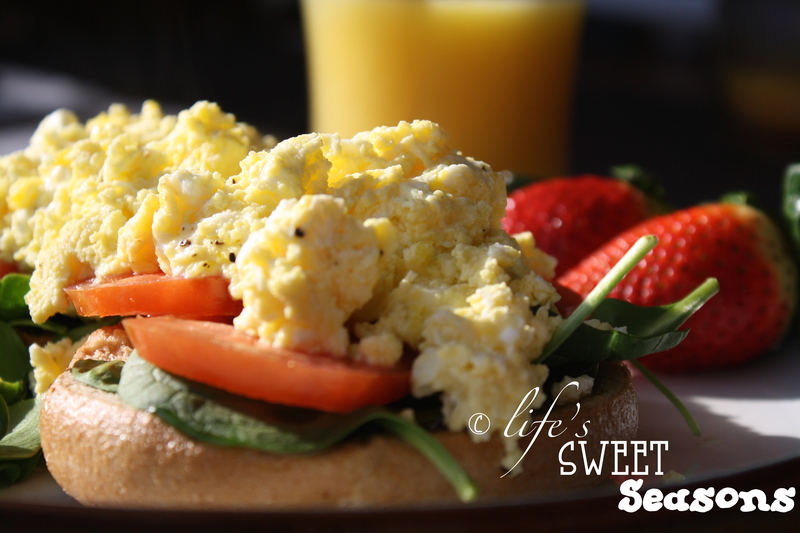 Spoon the warm eggs over the top of tomato, spinach stack and voila! Notes – This is a recipe for one so you’ll have to double for two and add for each additional person. You can always add more eggs if you aren’t satisfied with two per bagel. Also, don’t skip the apple-cider vinegar. It’s weird, I know, but it’s good! This is PERFECT in every way…the recipe, the blog, and your witty voice! I’m going to have to try these bagel thingings after I finish hiding my back-to-school purchases from my hubby. YIKES! LOL, I’ll pray that Armando is as forgiving as Mike. Thanks for your encouragement with the blog.